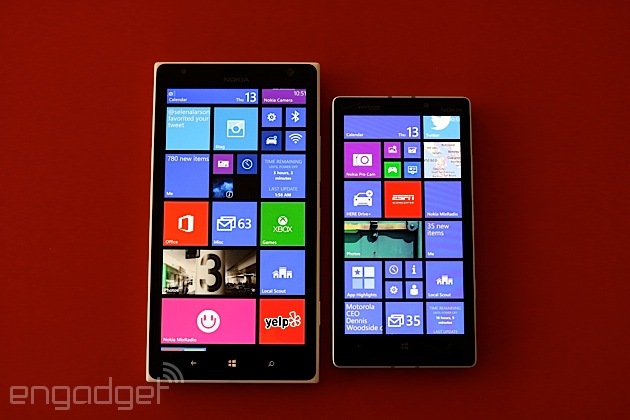 When Nokia came out with the Lumia 1520, we were treated to a new side of Windows Phone. All of a sudden, Microsoft's smartphone OS had come of age; it was using the best available hardware specs and a wave of big-name apps had finally arrived in the Windows Phone Store. Even so, we were concerned that the 1520's 6-inch screen size and AT&T exclusivity in the US would limit its appeal. 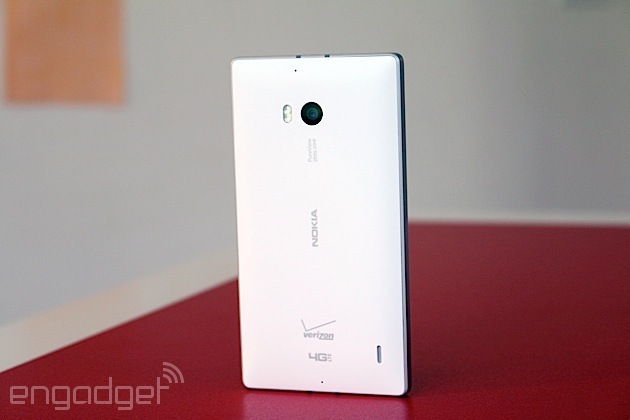 Last week Nokia announced the Lumia Icon, a new Windows Phone with nearly identical specs in a smaller, 5-inch frame. Finally, the perfect device for Microsoft to take on its high-end Android and iOS competition, right? Well, almost -- the Icon is a Verizon exclusive, arriving tomorrow for $200 on-contract (or $550 with no strings attached). Meanwhile, the other three major US networks don't offer anything comparable yet (outside of AT&T's 1520, anyway). That said, the Icon is still worth a look if you've already decided on Big Red. The Lumia Icon is the solid high-end Windows Phone that we've wanted for a long time. It has an amazing display, great performance and solid imaging capability, but its exclusivity to Verizon will severely limit its appeal. How would you rate the Lumia Icon? Windows Phone has grown up a lot lately. The Lumia Icon is the platform's new poster child, offering specs that would make even the most discerning of power users drool. That includes Nokia's 20-megapixel PureView camera, a 5-inch 1080p display, top-of-the-line quad-core Snapdragon processor, 32GB of internal storage, 2GB of RAM and a 2,420mAh battery, to name just a few specs. You can check out the full list below, but for now, you get the idea. All told, it's hard to find fault with the specs, but the hardware itself is potentially... polarizing. With its square shape, sharp corners and flat sides, it's as if Nokia took the Lumia 928 and changed the material from glossy polycarbonate to aluminum on the perimeters and matte polycarbonate on the back. Nokia used this same combination of materials on the Lumia 925, but that phone had a less severe design, one marked by gentle curves. What's more, the non-removable back here bulges out slightly from the rest of the chassis. The idea was for the camera to sit flush with the device, but even so, a flat back would have made for a more streamlined look. Finally, at 5.86 ounces the Icon is a little heavy -- heavier than the 4.5-inch Lumia 1020, anyway. That said, it's still significantly lighter than the 6-inch 1520, which means it's also more comfortable to carry around. On the other hand, the aluminum sides and polycarbonate matte back make the Icon feel reassuringly sturdy. In particular, its 5-inch frame is small enough to fit snugly in my hand, and the edges have a blunt cut that left my fingers plenty of room to grip the device. At 9.9mm thick, it's thicker than most high-end smartphones, but the arched back helps make its size less of a detractor from our enjoyment of the device. Oh, and speaking of durability, Nokia and Verizon must have focused on making the Icon as iron-clad as possible, because in addition to the metal sides, the phone rocks a Gorilla Glass 3 display. The glass itself curves slightly outward, so it's exposed a little more than a standard flat sheet; it makes sense, then, that Nokia would want the glass to be as scratch-resistant as possible. It's not shatterproof, so you still don't want to drop it face-down on concrete, but you should at least feel comfortable putting it in the same pocket as your car keys. As an aside, although those metal sides look nice and do indeed provide some extra durability, they're also quite prone to dings and scratches. This is an issue we've experienced with the latest iPhones and the HTC One, to name but two examples. We didn't see anything show up in our time reviewing the device, but if you're going to be using the Icon for a year or two, the sides may look like the surface of the moon by the time you're done with it. It may do a good job protecting your phone from impact, but it probably won't emerge without a few battle scars. Farther down the back, you'll see two Verizon logos next to the external speaker grille. The sound comes out loud and clear, despite its awkward placement toward the top of that sloping back cover. You'll also notice two tiny holes on the back for microphones (one near the top, one near the bottom). These make up just half of the phone's four-mic setup for directional audio recording; the other two are located on the front. And, as with most Verizon phones, you also have the option of wireless charging, thanks to an embedded Qi module. The right side of the Icon features the typical three-button layout that Windows Phone users have become accustomed to (for novices, this includes a volume rocker, power button and two-stage shutter button). The Icon's keys stick out pretty far, but for some reason I had a difficult time pressing the camera button gently enough that I didn't cause shaking and camera blur. Ultimately, I felt more comfortable taking shots with the virtual on-screen shutter button. 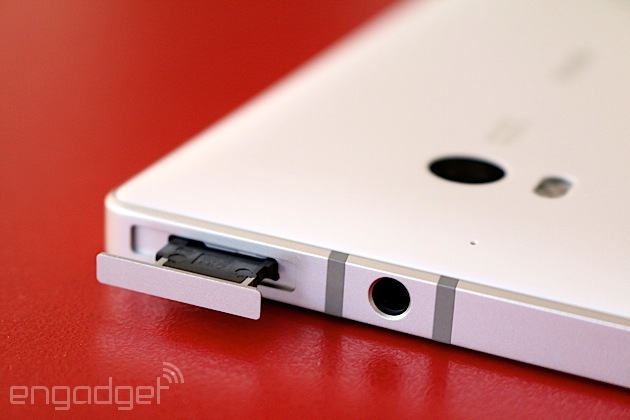 The micro-USB charging socket sits along the bottom edge of the phone, while the 3.5mm headphone jack lives up top. For symmetry's sake, both ports are flanked by a pair of antennas. However, there's a nano-SIM slot on the top-left corner that renders pointless any effort to make the sides look symmetrical. The Icon's SIM slot features a small divot instead of a pinhole, so you'll need to dig out the SIM card using your fingernail. As I discovered, this makes it much more difficult to open if your nails happen to be well-trimmed. When we saw the Lumia 1520's 6-inch, 1080p display, we couldn't wait to see how that kind of screen quality would look on a 5-inch device. Having finally gotten our wish, we're happy to say the Icon doesn't disappoint. This time Nokia went with a 1,920 x 1,080 AMOLED ClearBlack panel, with a pixel density of 441 ppi. As expected, the dark colors are darker here than on the 1520's LCD screen, while the whites are just a shade dimmer. One of the nice things about this type of display is that the darks blend in with the bezel, making the screen feel more expansive than it actually is. Color saturation is on par with the 1020's OLED display as well, but if you don't like it, Nokia offers the ability to adjust it, along with the color temperature. In addition, we could easily see the bright, 500-nit screen in direct sunlight, and the viewing angles are some of the best we've seen. 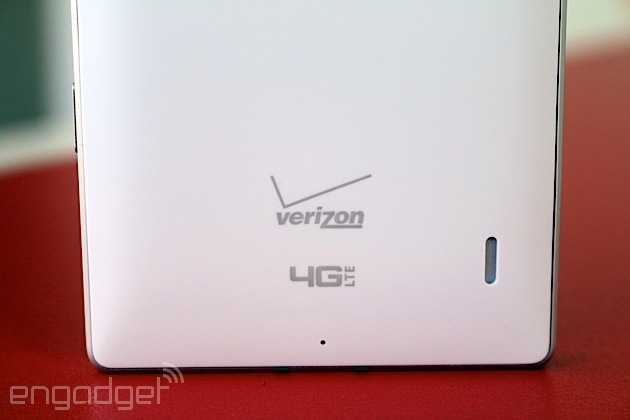 Since the Icon is a Verizon exclusive, its LTE radio runs on Verizon-compatible bands (700/AWS, to be specific). When 4G isn't available, it also supports 3G CDMA. Although we're disappointed that it doesn't feature global LTE roaming of any kind, international travelers can use it on most GSM networks around the world; it has quad-band HSPA (850/900/1900/2100) and quad-band GSM/EDGE (850/900/1800/1900). In fact, since it's unlocked, we were able to use an AT&T SIM and get an HSPA signal. Windows Phone 8 is now on its third major update, and the latest firmware allows the Icon to have all of the best specs on the market. Nokia took this update, bundled it with its own suite of software features and functionality and called it the "Black" update. This is the same setup that we enjoyed on the Lumia 1520, as well as a litany of older devices that also run the new software. Aside from the obligatory Verizon apps, which are limited in number and can all be uninstalled, the Icon comes preloaded with the usual Nokia and Microsoft necessities: You'll have roughly 500 Nokia apps (slight exaggeration), a handful of Here apps for navigation, the upgraded camera app, Data Sense, a few Bing apps and so on. There's nothing out of the ordinary here, and nothing we haven't touched upon before. One thing worth noting is that since the Icon has a 5-inch display, it qualifies as a "larger screen" and is rewarded with a third column of icons on the Start Screen, just like the 1520 has on its 6-inch display. Despite the fact that you get more screen space on the Icon than the 4.5-inch Lumia 1020, the Live Tiles are actually smaller on the Icon so you have more room for that additional column. 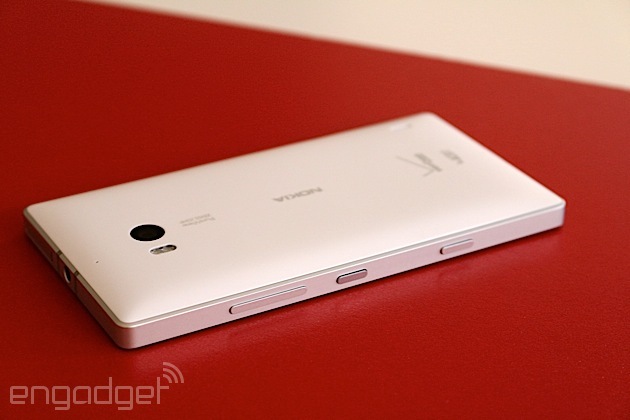 High-end Lumia phones and good imaging seem to go hand-in-hand. Nokia's always excelled at mobile photography, and it's recently raised the bar with its PureView tech, which we earlier saw in the Lumia 1020's 41-megapixel camera. That camera was so impressive, in fact, that even something as stellar as the Lumia 1520's 20-megapixel shooter felt a little like a downgrade. 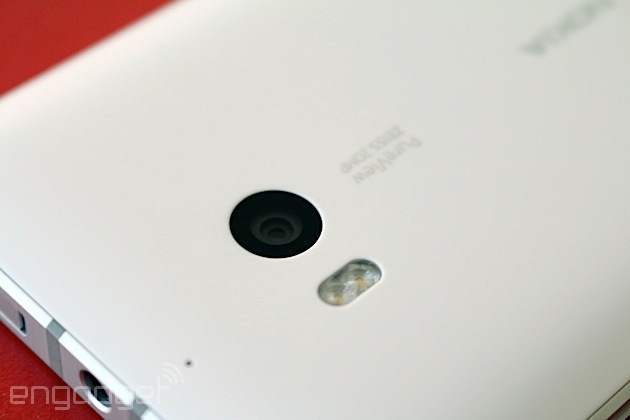 The Lumia Icon's camera is closer to the 1520's, since it shares many of the same specs and characteristics. If that counts as cutting corners, then we can live with that. The best part of Nokia's photo experience is the camera app, which gives you a full suite of manual settings to help you get the perfect shot -- ISO, white balance, exposure and shutter speed can all be adjusted in real time, so you're not wasting time poking around the settings menu. And, as part of Nokia's Black update, you now have the option of getting a copy of your high-resolution photo in RAW (DNG) format. If you're limited on storage (32GB is a lot, but there's also no microSD slot), we'd recommend you switch over to the standard high-res JPEG option, since each RAW file takes up nearly 25MB of space. Largely thanks to the Icon's smaller aperture, the 1020 still technically takes better photos in low-light situations, but even so, we were rarely disappointed in the Icon -- as long as there was even a smidgen of light, we were able to achieve well-lit, detailed shots. We couldn't rely on the shutter button for these images, however, since it's harder to press and any little shake or bump resulted in blur. In daylight, our sample pictures showed more color saturation, and a white balance that was slightly warmer than on the 1020, although the dynamic range wasn't quite as high. So while there are clearly some trade-offs, all but a few imaging enthusiasts will find both phones satisfactory. Videos are captured at 1080p, and in traditional PureView fashion you get to choose among 24, 25 and 30 frames per second. (You can also bump the resolution down to 720p if you prefer.) The level of detail here is pretty good, and a bit rate of 19 Mbps certainly helps, but we noticed that the continuous focus is a little too active. What's more, our fast-paced action footage was sometimes choppy. In low-light conditions, the camcorder had an even more difficult time trying to stay continually in focus; the footage wasn't as crisp and the white balance even shifted on occasion. On the other hand, we picked up impressive audio, thanks to the four-mic setup. In our sample video, for instance, the two front-facing mics did a fantastic job filtering out the noise of a nearby construction crew. Aside from the superb audio, you shouldn't expect more on the video front than what you'd get from any other flagship device. Right now, at least, Qualcomm's Snapdragon 800 quad-core processor reigns supreme, which means the Icon (clocked at 2.2GHz) is among the best in its class. And while even low-end Windows Phones run well, it's still so much nicer to play graphics-intense games on a device with a top-of-the-line chip. Games like Asphalt 8 play smoothly, and we noticed that the phone saved and rendered its high-res images faster than the Lumia 1020. (In fact, it was even faster than the 1520.) In short, this is the best-performing Windows Phone we've ever used. As for synthetic tests, it scored slightly better than the 1520 on every benchmark test we ran, as you can see in the table below. Battery life was a big question-mark for us going into this review, just because high-res screens and powerful quad-core chipsets are known to take a toll on runtime. In this case, though, none of that appears to make a difference. The Icon's 2,420mAh battery lasted through a 12-hour day that included nonstop GPS navigation, streaming music, emails and phone calls. We still had roughly 35 percent juice left over, which means you should have no problem squeezing out a full day on a charge. And with more moderate usage, you can even get through a day and a half -- not bad for a 5-inch flagship device. The only thing that gave us pause was when we were taking a steady flow of pictures and videos for testing; in one instance, the battery drained by 25 percent in an hour. Call quality is above average, which shouldn't come as a surprise to most Verizon customers, and the volume (for both internal and speakerphone calls) is loud enough that we didn't have to crank it up to the max settings to hear comfortably. It handles movies and music quite well, and we had no Bluetooth connection issues. We were also able to quickly pinpoint our location via GPS, but we noticed that the Here Drive app sometimes failed to re-route when we went the wrong way. The Icon doesn't have a lot of Windows Phone competition at the high end. As we said earlier, the Lumia 1520 is the only other device with the same top-shelf specs, but it's only available on AT&T in the US and is a significantly larger phone. On Verizon, your only other options are the HTC 8X ($50 on-contract), Samsung ATIV Odyssey (one dollar) and the Nokia Lumia 928 (free), none of which come close in terms of specs or performance. For now, the Icon rests on top of the Windows Phone world, but it's hard to know for sure how long it will stay there. 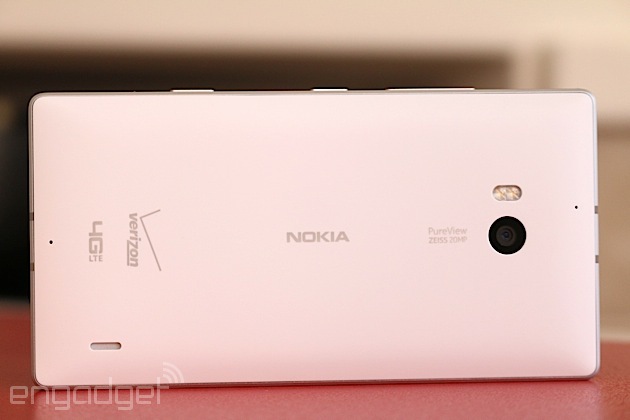 Samsung's rumored to have a high-end WP8 device coming out on Verizon. 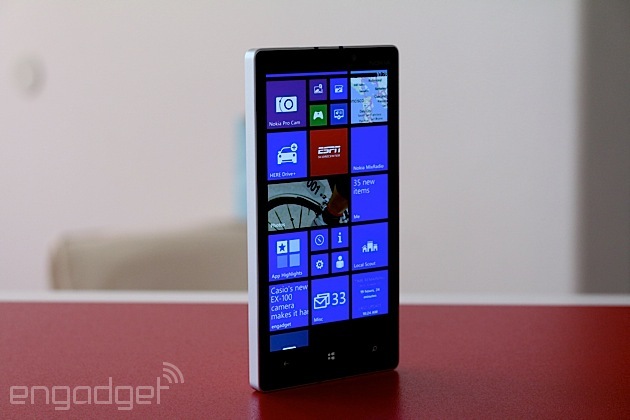 Then there's Windows Phone 8.1, which is rumored to launch sometime in April with a full lineup of new devices. In short, there's lots of good stuff ahead. 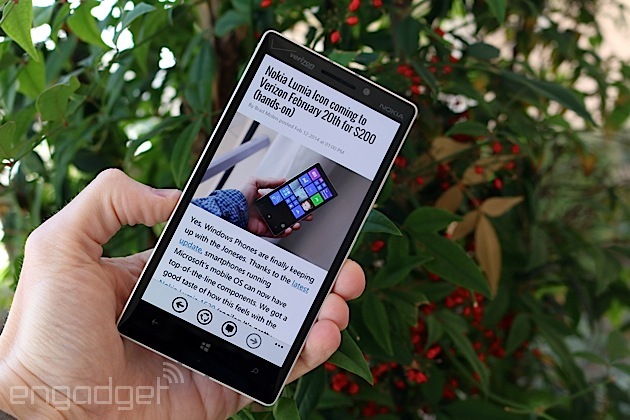 As of this writing, the Lumia Icon is the best Windows Phone device. Just like it did with the Lumia 1520, Nokia managed to cram a fantastic imaging experience into state-of-the-art hardware. But unlike the 1520, the Icon is small enough to appeal to the masses. Although it may not be the sleekest handset, the Icon is still a sensible option (if not the best option) for Verizon users who want the best photo-taking experience possible -- and don't want to sacrifice other specs to get it. It's unfortunate that this combination of size, specs and functionality is only available on one carrier in the entire world. But on the bright side, this may change in the near future: Nokia will likely announce new Lumia devices in the next few months, which means the Icon may soon be just one in a handful of high-end Windows Phones. Even if that happens, however, the Lumia Icon will still be a great choice for anyone interested in a good Windows Phone device on Verizon. Its beautiful display, speedy processor and good battery life are just a few reasons to give it a close look. Most important, though, is what this means for the future: The last two high-end Windows Phones have been much better than anything we've used before, and it's only going to keep improving. Daniel Orren and Edgar Alvarez contributed to this review.